Bethany Rippon could not make a basket last Wednesday against Montoursville. She played great defense and helped the Green Dragons win, 31-24, but would have liked scoring a few points in her first game at Lewisburg’s new gym. But she was not disappointed. She was playing again. Combine that with a win and Rippon had no complaints. Neither did Lewisburg because without its versatile senior’s lockdown defense, it would not have won the game. Rippon missed all but three games last season after suffering a torn PCL in December. Watching games hurt maybe more than her knee did and Rippon is savoring the chance playing a game she loves. Rippon can score and produced 11 points in Saturday’s 47-25 win at Milton. She also averaged near double figures as a sophomore and produced nine points in a season-opening 44-31 win at defending District 4 Class A champion Lourdes. She does so much more, too. Rippon can play guard or in the post and she can guard both positions as well. She grabbed seven rebounds against Montoursville and has the ability to stuff a stat sheet. That provides Lewisburg (3-1) a huge boost. Rippon was one of several players who suffered season-ending injuries last year. Lewisburg won a district playoff game and reached the Class AAAA state tournament, but finished 11-15. With Rippon back, the Dragons now look like a district title contender. Rippon can stretch a defense with her outside shooting, attacks the basket well and complements an offense that features dynamic point guard Grace Kelleher and 6-foot center Emily Sholly. Expect scoreless games against Montoursville to be the exception, not the norm. But expect all the other qualities Rippon showed in that game to be the standard all season. And that makes Lewisburg a lot more dangerous. South Williamsport (4-2) is off to its best start since 2011 when Maryland graduate Tierney Pfirman was opening her senior season. 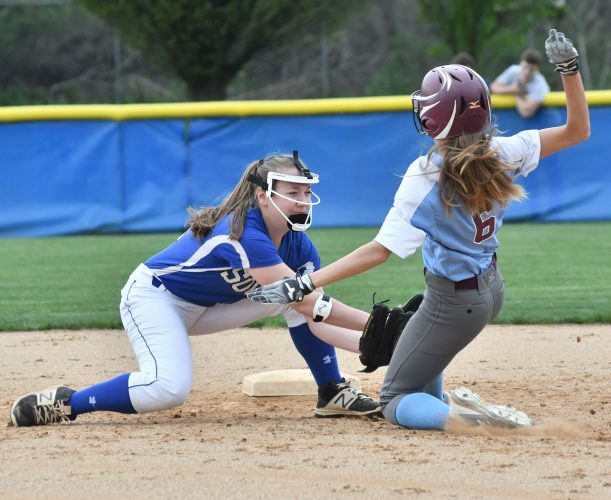 The Mounties went 1-21 two years ago, but made a four-win improvement last season and can exceed that win total if they capture this week’s North Penn-Mansfield Tournament championship. Much work remains, but this is a program that is working its way back and could be a darkhorse title contender in a wide-open Class AA field. The Mounties showed how dangerous they can be when they went to Hughesville and beat the 2017 Class AAA finalists 57-54. They added their third win against a 2017 playoff team last Monday, defeating Muncy, 37-28. Hughesville routed South twice last season and has four starters back from that team. Overcoming a halftime deficit against a quality team in a tough environment was exactly what South needed. If South reaches the postseason look back at the Hughesville win as the turning point. This is a group that has worked hard the past three seasons. That win provided validation. Now, the Mounties now they how dangerous they can be. Megan Weber is averaging 14.8 points per game and forward Alyssa Johnson scored a career-high 21 points against Hughesville. Guard Haley Neidig was sensational against Muncy, scoring a career-high 17 points while adding three assists and three steals. House did a bit of everything in that game and Julie Anthony added seven rebounds and seven steals. South showed some well-rounded threats in those games and is developing more weapons for when teams try and slow Weber. Even after losing to Mount Carmel last Wednesday, South still looks like a team poised for a breakthrough. The Green Hornets romped to convincing wins against Cowanesque Valley and Wyalusing and are off to their best start this decade. Three players are averaging more than 12 points per game and junior Emma Poirier is having a big breakout season. Poirier is among the area’s leading scorers and recorded a double-double against Wyalusing, going for 13 points and 12 rebounds. Her sister Lizzie also is one of the area’s premier players and grabbed 12 rebounds in the two wins while scoring 24 points. Rachael Tuttle pulled down 11 rebounds against Wyalusing and has at least nine rebounds in all seven games. Wellsboro is the lone undefeated District 4 Class AAA team remaining. Despite having only two starters and limited varsity contributors back from last year’s 19-win team, Jersey Shore has started its season strong and is tied for first in the HAC-I. The Bulldogs recorded an impressive 58-46 win against drastically improved Midd-West, pulling away in the second half, and are 4-0 when they top 50 points. Averie Hess scored a season-high 16 points in that game and Janel Eck continued surging, scoring 10 in a 55-24 win three days later against Central Mountain. Junior guard Hannah Kauffman can do damage inside or outside and leads the area in scoring after producing 34 points in Jersey Shore’s two wins. Southern Columbia dealt the Lancers a setback, defeating them, 52-46, but they bounced back in impressive fashion, routing 5A Pottsgrove, 66-18. Loyalsock also defeated Williamsport earlier in the week, 71-36 and has scored 60 or more points five times, an area-best. Three players are averaging in or near double figures and junior guard Maddie Fox produced 40 points in the two wins. Freshman Summer McNulty is making an immediate impact, scoring 13 points each against Williamsport and Southern Columbia. Sam Stopper showed how well-rounded her game is against Williamsport, scoring 15 points and adding nine rebounds while helping spark the defense when Loyalsock closed the game on a 26-1 run. The Griffins earned their biggest win yet, going on the road last Wednesday and beating fellow 2017 Class A state qualifier Benton, 46-37. The win gives Sullivan an early lead as it pursues a second straight Mid-Penn championship. The Griffins have not lost a Mid-Penn game in two seasons and are receiving steady contributions throughout their rotation. Mykenzie Malacusky, Jessica King and Stef Kramer all are averaging in double figures and Leah Beinlich, Alexis Randall and Bethany Beinlich also have had double-digit games. Sullivan’s defense has been outstanding as well and the Griffins have not let a team reach 40 points yet. The Spartans went 3-0 last week and their resurgence was sparked by what this program’s foundation is built upon–stifling defense. Hughesville did not let St. John Neumann, Bloomsburg or previously undefeated Warrior Run score more than 28 points, allowing just 24.7 points per game. The 34-28 win at Warrior Run was especially impressive after the Defenders started 3-0 and were a night removed from beating 4A title contender Shikellamy. Hughesville is 5-0 when it allows fewer than 60 points in a game and has three players averaging more than eight points per game. Sophomore guard Jade Cordrey is developing into a nice weapon and scored a career-high 16 points against Warrior Run. Hughesville outscored Warrior Run, 13-7 in the fourth quarter and rallied from a first-half deficit against a team that has yet to allow 35 points in a game. A season ago, King started flourishing late in her freshman season. Now the sophomore forward is becoming a force. King played her best scholastic game against Benton, scoring 11 points, grabbing 18 rebounds, blocking eight shots and adding four steals. King is strong inside, tough on defense and could become one of the district’s best post players if he keeps progressing. Self played in West Virginia last season and Pennsylvania opponents are learning what their bordering state’s opponents already knew. This girl can play. Self is among area leaders in scoring and assists and had 45 points, 11 assists and 10 steals in Wellsboro’s two wins. Self scored a season-high 26 points against Wyalusing. Thursday’s game is a rematch of a thrilling third-place AAAA district game last season that Jersey Shore won 35-33 when Hess scored on a buzzer-beating layup. That game was a lot of fun with the lead going back and forth and the rematch could be exciting again as teams who are a combined 7-2 see how they measure up in the 4A field early this season.